Are you looking for a way to GIVE back this Thanksgiving? 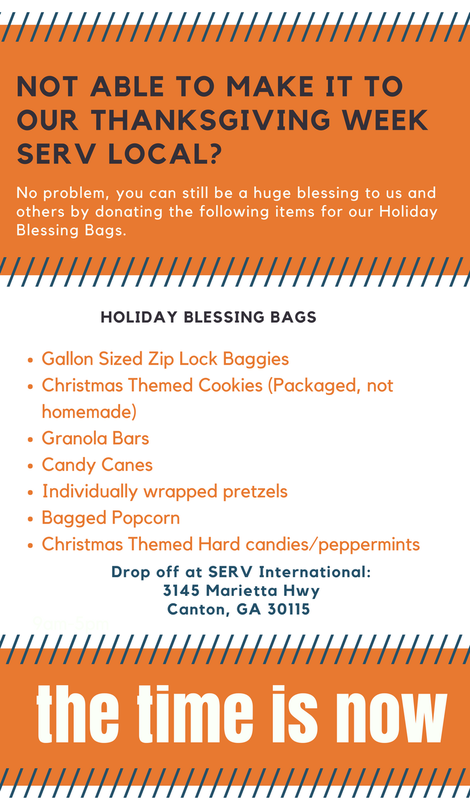 SERV Local will be offering a different opportunity each day for you to be involved in blessing our community, surrounding communities and to the ends of the earth. This Thanksgiving we are thankful for how God has blessed us and we want to be a blessing to others in return. Join us this week to help reach out and show God's love to our community. We have 3 options for you to serve here at our U.S. Headquarters: 3145 Marietta Hwy. Canton, GA 30115. To sign up for a service opportunity, visit www.servone.org/volunteer. We would love it if you would be willing to come out from 8am-11am and help us SERV our community by giving out free coffee and donuts! From 11am-3pm we will be packing out Blessing Bags here at the SERV Offices. These will be distributed throughout the month of November to people in need in our community. This is an ALL DAY event. You can come by at any time from 9am to 5pm to help out in our SERV Store. The store is located in the same building as our offices and helps to fund the ministry of SERV International. We need your help putting furniture together, sorting items, hanging clothes, etc. With your help, we can get as much merchandise on the shelves as possible so we are ready for Black Friday and can continue to fund the amazing work SERV is doing by feeding people across the nations.